Regenerative Medicine Day at Skolkovo. February 14, 2013 declared as a “Regenerative medicine day in Russia” by Skolkovo Innovative Centre. 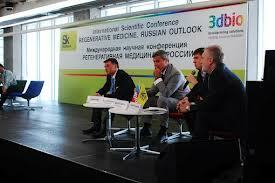 The world well known scientists of the field made presentations in the Hypercube of Skolkovo. Conference devoted to a cross-disciplinary (biology, medicine, physics, chemistry) science - regenerative medicine – was sponsored by the Russian company 3D bioprinting solutions (executive director Aleksandr Ostrovsky, chairman of the board of company grouping INVITRO). A group of company’s scientists is already working at organs and tissues 3D printing technology from human autologous cells under the guidance of Vladimir Mironov - organ bioprinting technology pioneer and professor of Virginia Commonwealth University, USA. Since the autologous cells are isolated from patient’s body, this technology may become a solution to a problem of biocompatibility and opens up the possibility to create inexpensive organ prototypes and efficient ways of tissue substitution in the longer term. Vladimir Mironov had a presentation at the Skolkovo conference, where he explained what the bioprinting is, told about pending issues of this technology and already implemented projects, among which are: a device for tissue spheroid creation and a patented technology for nanofiber vascular implant creation. Mironov said at the press-conference, that first simple organs will be printed by 2030. 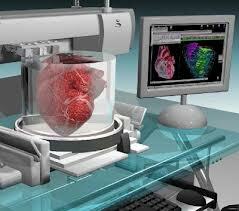 3D-bioprinting – is a comparatively new and fast emerging sphere of regenerative medicine. The main point of the technology is that 3D-printer is filled in with cells, layer of which is put onto special surface and then it builds 3D-organ layer by layer. 3D-bioprintng is similar to 3D-printing technology, which allows creating almost everything by means of special printers. According to Helena Livshits, director of medical cluster Biomed of the Skolkovo Foundation, a motorcycle able to run is printed during a couple of days. 3D-bioprinting task is creation of human “spare parts”, says Aleksandr Ostrovsky, Invitro Company Group. “Medicine is getting more expensive, and if there is no way out, the bills may grow up to vast sums”, says he. Bioprinting is an impressive direction of regenerative medicine, but not the only. Time shows, which technology is more effective, most likely it is going to be either a combination of various approaches or different solutions for certain organs and tissue types. The examples of these approaches were presented by the Professor of regenerative surgery of Karolinska Institute (Sweden), the winner of Megagrant of the Russian Federation in 2011, Paolo Macchiarini. In particular, he developed a technology for trachea creation for transplantation and performed the world first laryngo-tracheal transplantation with the use of patient’s stem cells in the frames of the Megagrant. Among other contributors was professor Xuejun Wen, of Virginia Commonwealth University. He told about the computerized tissue creation for regenerative medicine. The main topics of the panel discussions were the present stage of regenerative medicine in the world and in Russia, its development prospects, main participants of the process and the main trends. Gennadiy Konstantinov, professor of the Higher School of Economics, spoke to the problem of private equity in this science-based sphere. His presentation was followed by the panel discussion with the participation of the Foundation for Assistance to Small Innovative Enterprises in Science and Technology representatives (Ivan Bortnik’s Foundation), Russian venture company representatives, the founder of “Science for Life Extension” Foundation Mikhail Batin and other experts.